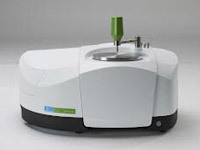 Fleming PTC has recently expanded its service portfolio to include the technique of FTIR. To this end a Spectrum Two with ATR has been purchased from industry leader Perkin Elmer and has rapidly confirmed itself as a complementary and staple polymer characterisation test. FTIR enables the rapid identification of many polymers and polymer additives.